It’s a scene that, today, brims with prophetic romance but, in retrospect, may have been a little peculiar at the time. It’s the early 1960s on Long Island, and there, sitting alone in his family’s suburban driveway, is a little boy. No more than 10 years old, the boy has snuck the keys to his father’s car. It’s a hot, clear summer’s night: the perfect kind of night for a young Bob Costas. Sure, a television gleamed in the living room of the house, but young, baseball-obsessed Bob was in love with the radio, and, on a night like this, the big 50,000-W radio stations of the day streaked across American skies and landed in his father’s dashboard like commercial jets touching down at Idlewild Airport. The baritone voice of Bob Prince poured in from KDKA Pittsburgh, Ernie Harwell streamed in on the waves of WJR Detroit, and, on the best of nights, between the static, there was Jack Buck and Harry Caray all the way from KMOX Saint Louis. Mickey Mantle may have been his hero on the field, but it was the likes of Mel Allen, Red Barber, and Marty Glickman who would be his influences. 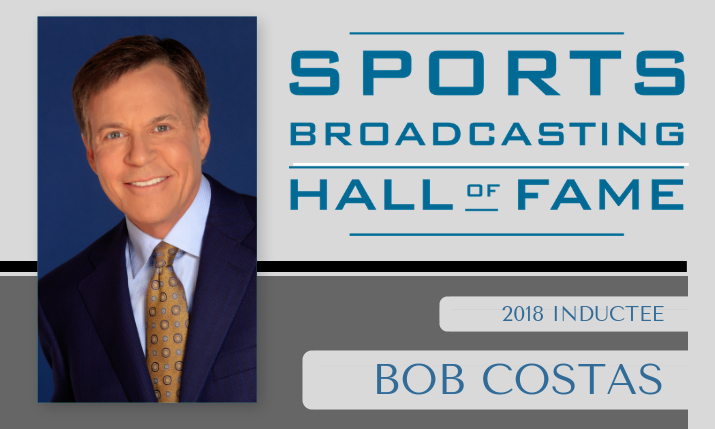 At even that young age, Costas had his eyes set on a dream, one that would ultimately see him become one of the most impactful broadcasters of the modern television era. 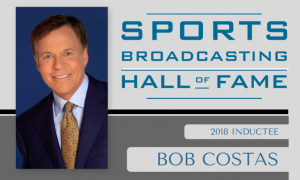 Costas, a 28-time Emmy Award winner, has been the face of many of the largest sports events that U.S. television has ever produced, while mastering his craft in a variety of roles. Whether it was the play-by-play call of the World Series or the NBA Finals or sitting behind the desk to welcome viewers to familiar gridirons across America for a big night in the NFL or to foreign cities across the globe for the Olympic Games, he was the benchmark of sportscasting. Graduating from Syracuse in 1974, Costas quickly landed on the scene in what would become his adopted hometown, St. Louis, calling games for the Spirits of St. Louis of the old ABA on the same KMOX that he could catch on those clear nights on Long Island. He even got the chance to learn from and work with one of his childhood idols, Jack Buck. Soon came regional swings of NBA and NFL broadcasts for CBS before getting his big break when he was hired by NBC Sports. With that break, however, came a dose of adversity. At just 28 years old, there was no denying that Costas was young for the national scene. NBC Sports was putting up a fresh face as one of its top anchors, and his new boss, Sports Broadcasting Hall of Famer Don Ohlmeyer, let the kid know he thought he looked like a 14-year-old. Costas found that sense of humor in himself in perhaps the unlikeliest of places: late-night television. David Letterman, who was also at NBC at the time, began to have Costas on for comedy bits, making the broadcaster announce all kinds of wacky events — such as elevator races in 30 Rockefeller Plaza — in his serious, grandiose style. Costas credits those appearances — in addition to stops at shows hosted by Jay Leno, Conan O’Brien, and even Johnny Carson — with helping break him in. The baby face quickly turned into boyish charm as U.S. viewers fell for the intelligent, well-spoken young man who would become one of the most respected minds and voices in the history of sports media. Through his storied career, Costas was part of many of sports television’s biggest blockbusters. That is especially so with the property he is most commonly associated with: the Olympic Games. Costas served as NBC’s primetime host for a U.S. television-record 11 Olympics (1992-2016), when the Games were at the peak of their television glory. The 2012 London Games were the most-watched multi-day television event in U.S. history, reaching a staggering 217 million viewers. From 2006 to ’16, he also hosted the wildly successful Football Night in America. NBC Sports’ critically acclaimed pregame show leading into NBC Sunday Night Football was commonly one of the most-watched shows on television week in and week out. He also served as host of six Super Bowls, including Super XLIX in 2015, which still ranks as the most-watched program in U.S. television history (114.4 million viewers). “Bob appeared in our living rooms in the final years of [broadcast-]network dominance of the television airwaves, when a single baseball broadcast each week thrilled friends and created legends,” says Baseball Hall of Famer Joe Morgan, who worked with Costas at NBC in the 1980s and ’90s, including the seven-game classic ’97 World Series between the Indians and Marlins that earned Costas his first Emmy for play-by-play work. Costas also held true to his elite standard for journalistic excellence. He hosted numerous interview and commentary programs throughout his career, including On the Record and CostasNOW, both of which aired on HBO. Never afraid to stand toe-to-toe with global juggernauts, he has conducted no-holds-barred interviews with the likes of brash WWE owner Vince McMahon on his HBO show or with then-President George W. Bush during a live NBC Olympics telecast in Beijing. He also earned industry-wide acclaim — and even a News and Documentary Emmy — for his riveting interview with Jerry Sandusky, which aired mere days after the former Penn State coach was accused of sexual child abuse. Numerous times, Costas has taken on the mantle as the conscience of U.S. sports fans, unafraid to tackle controversial issues like gun culture, Russian President Vladimir Putin’s association with the Sochi Olympics, or even the impact that concussion science would have on the future of American football. Throughout the twists and turns of his career, however, there has been one constant: Costas’s love for the game that he spent those summer nights as a child listening to on the radio. In 2009, he joined MLB Network and still calls marquee games, including postseason games. In 2018, he received an honor that surely would have thrilled that little boy in his dad’s car: he was named recipient of the Ford C. Frick Award, inducting him into the National Baseball Hall of Fame in Cooperstown. It was a fitting tribute for a man who was always more than just a legendary sportscaster. He became a welcome guest in millions of Americans homes and, in many ways, had a way of shaping the entire sports world.